Hemangioma is a common congenital disorder which happens in neonates or infant, with predilection sites in the face and neck. Not every case of hemangioma requires a surgical treatment. Some will regress spontaneously. In some cases which requires resection, the aesthetic aspects of the repair must be considered as the sites of the lesion involved the face and neck areas, which is greatly exposed. month after to assess scar appearance. Follow up evaluation revealed less visible scar compared to the immediate result. A well-known technique used by many plastic surgeons is the circular incision followed by purse-string closure. The use of this technique was known to produce less visible scar. 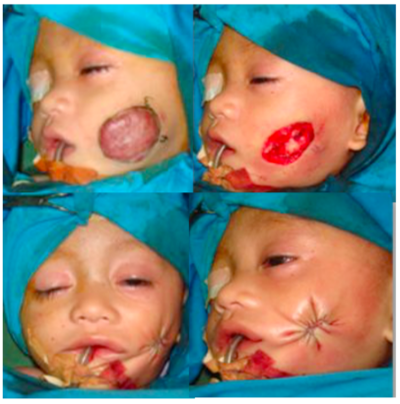 Hemangiomas acts as a tissue expander, which make it applicable to close the defect using purse string closure.